I love creamed spinach. I have fond memories of going to Cafe Scheherahzade in Melbourne during the eighties and feasting on their latkes and creamed spinach. Tragically Cafe Scherherazade closed its doors eight years ago so their creamed spinach now exists only as a memory. During the winter, I had a sudden craving for some old time Eastern European style creamed spinach. I tried to track down a recipe online, to recreate the Scherherazade magic in my own home. I didn’t have much luck, most of the recipes online for creamed spinach had a bechamel sauce base and seemed overly rich and heavy. Cafe Scheherazade’s retrospective culinary fame is all about their schnitzels, cabbage rolls and latkes, their creamed spinach has been long forgotten. My memory is probably flawed and the original Scheherazade spinach was probably as rich and heavy as all the internet recipes, but to deal with my disappointment I went back to my tried and true creamed spinach from Madhur Jaffrey. The original recipe is Jaffrey’s version of the classic Punjabi dish palak paneer or spinach with cheese. Palak paneer is ubiquitous on Indian restaurant menus and I almost always order it when I’m eating Indian out, but at home I can’t be bothered with the cheese, I really just want the spinach so this is how I make it. 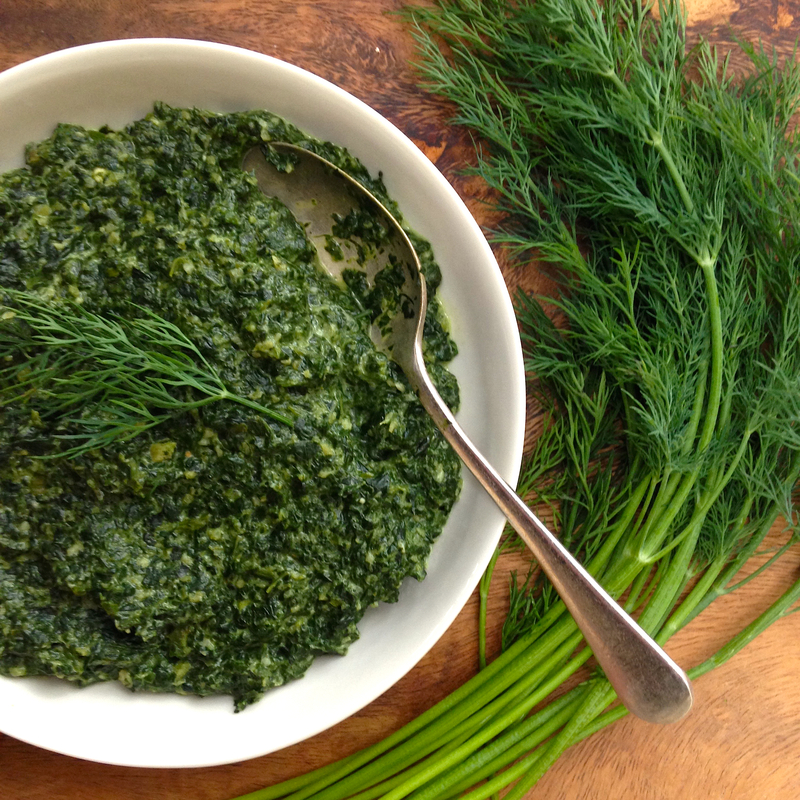 The dill is a nod to the creamed spinach of Scherherazade which now only exists in my imagination. The dill is good though and does seem to give it a slight Eastern European accent. In my twenties I used to make latkes for dinner parties, instead of serving them with sour cream I’d serve them with a yogurt raita, kachumber salad and lime pickle. It really worked! I think I might be onto something with the Indian/ Eastern Europe fusion thing. This recipe starts with a lot of raw fresh spinach that melts down. I use a large 30cm stir fry pan, you need something with quite high sides to accommodate the large mass of spinach. I rarely have cream on hand and as this recipe uses only three tablespoons it’s not worth buying a tub of cream so I usually use yogurt which does the job for the creaminess. The thing I think I adore about creamed spinach is the smoothness so while you don’t have to process the spinach I always do because it’s not really creamed spinach otherwise. I always use fresh spinach but you can use frozen spinach defrost it, drain it and cook it for a shorter time in the garlic/ ginger paste. Place garlic, ginger and chilli in small bowl of processor or blender with 3 tablespoons of water and process until smooth paste. You will have to scrape down the sides of the processor at least once. Heat oil in a a large saute pan and add paste. Take care as it will splatter a bit. Fry paste for about a minute and them add spinach, dill and about 1/2 teaspoon of salt. Toss spinach around in paste for about a minute then cover the pan, turn down heat and cook gently for fifteen minutes. There should be enough moisture on the spinach leaves to cook the spinach but add 1-2 tablespoons of water if it is too dry. Place cooked spinach and cream or yogurt in food processor and process until smooth. Taste and adjust seasonings, add more salt or yogurt and cream if desired. Place spinach back in pan and heat gently before serving. Garnish with extra chopped dill.